Rosetta’s COSIMA instrument – the Cometary Secondary Ion Mass Analyser – has detected tens of thousands of dust grains since arriving at Comet 67P/Churyumov-Gerasimenko. Diversity of particles seen on a small area on one single target. This image section measures 2.5 mm across, with light coming from the right. 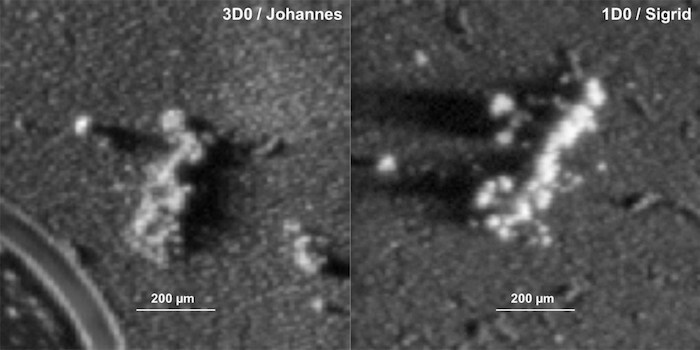 Examples of a compact particle (a), a shattered cluster (b), a glued cluster (c) and a large rubble pile (d) are seen in this small area. The grains collected from 11 August 2014 – 3 April 2015 across nine 1 cm^2 targets, when the comet was moving towards the Sun along its orbit from about 3.5 to 2 AU, provide the focus for a detailed study outlined in a paper published this month in the journal Icarus. 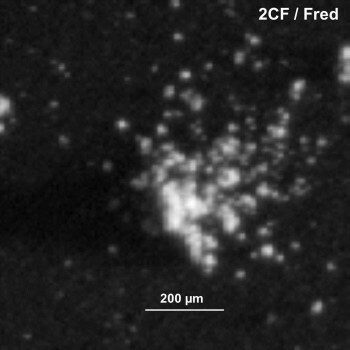 The paper, led by Yves Langevin of the Institut d’Astrophysique Spatiale at CNRS/University of Paris-Sud, France, describes the key characteristics of the different grain families imaged under the COSIMA microscope, the COSISCOPE. The images reveal the particles are extremely diverse at scales of just a few 10s of micrometers (μm) to several 100 μm. The grains were characterized according to factors such as the complexity of its appearance and its height above target – determined by analysing its shadow –, which in turn is related to strength of particle. In general, the dust families can be divided into compact particles or clusters, with the cluster group further subdivided into shattered clusters, glued clusters and rubble piles. The clusters are differentiated based on the different size distributions of the components, their spatial relationship on the collection plate, and the existence or not of any connecting matrix. The different grain families are described below, including reconstructed anaglyph images made by combining an image at the nominal position (red) and an image obtained by shifting the target by 4mm away from the LED (blue). The particles follow a naming convention based on COSIMA team members and other Rosetta mission team colleagues. Compact particles are defined as those with well-defined boundaries, more-often-than-not found without any related smaller ‘satellite’ particles. They have the longest and best-defined shadows of all the collected particles, but their direct contact area with the target is often small. Sometimes the grains have been seen to move during analysis, but they still maintained their shape, indicating a high cohesive strength. 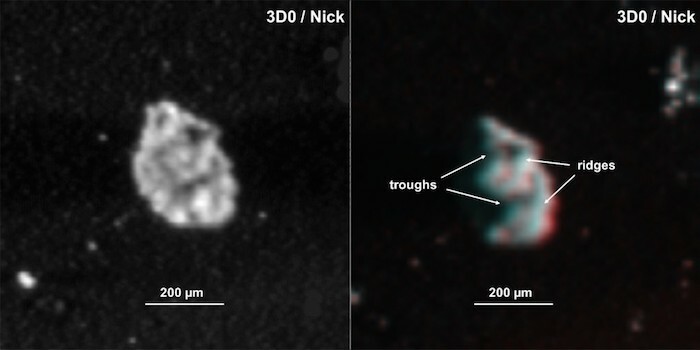 Examples of compact particles known as Nick (top), Kerttu (middle) and Julie (bottom). In the images showing Kerttu, the small particle above the scale arrived at a different time to Kerttu, and is therefore unrelated. Both images for Kerttu are anaglyphs taken under different lighting conditions, while for Nick and Julie only the right hand image is an anaglyph. Clustered particles exhibit well-defined sub-components and depending on the size distribution, height and relationship between the components, can be further sub-divided into three sub-classes: shattered, glued and rubble piles. Shattered particle clusters form a close group with no well-defined principal component. The distances between the individual components range from contact to distances in the same range as the size of the components themselves. They likely correspond to rearrangements of components on the target surface upon impact, with less drastic modifications of the components themselves. Shattered cluster Estelle, one of the most tightly-packed shattered clusters identified. It has three major components plus many minor components. The right hand image is the 3D anaglyph. 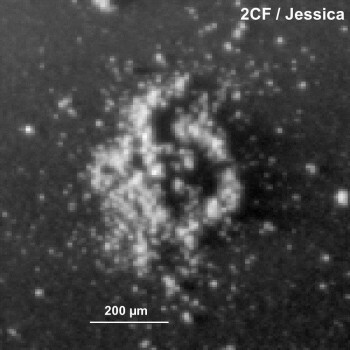 Large cluster Jessica has a complex structure and low height (40 μm), typical of a shattered cluster, but its fine-grained texture and large number of small outliers is typical of ‘rubble pile’ clusters. It is likely intermediate between the two categories. Glued clusters comprise relatively well-defined particles with an overall complex structure including sub-components which appear to be linked together by a fine-grained matrix, giving the appearance of a smooth surface texture. Their heights are usually low compared with the base area of the cluster, suggesting that the connecting matrix has not been able to maintain the shape of the particle as it impacted onto the target. Glued clusters Johannes and Sigrid. They both have a relatively low height compared to their base size, suggesting that the connecting matrix was not able to maintain shape of particle. Fred shares characteristics of both glued and rubble pile structures, transitioning from a more consolidated glued cluster in the lower left to a more disperse rubble pile in the top right. It could result from the fragmentation of a large parent particle close to the target, perhaps entering the target at an angle. The COSIMA team also explored any possible correlations between the dates and duration the plates were exposed for and the types of particles collected. For example, the plates are typically exposed for several months, for hours to days at a time, thus the collection period usually covers a wide range of orientations – and sometimes distance – of the spacecraft with respect to the comet and Sun. As anticipated, the collection rate was highly variable, with a broad and expected trend towards higher collection rates closer to the nucleus. 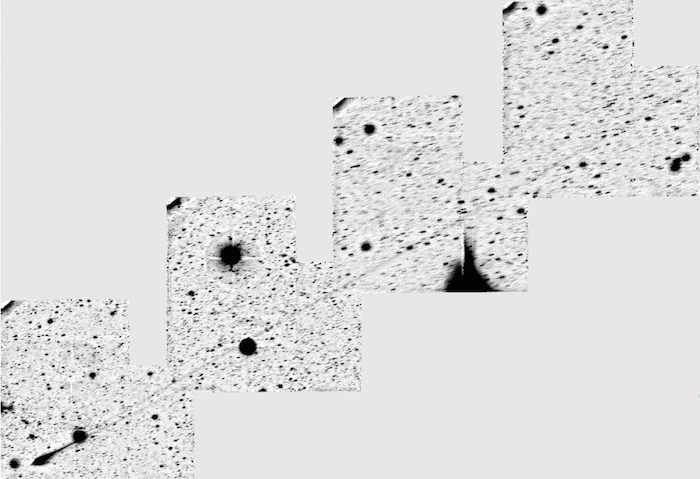 But it is not just comet activity that plays a role in the collection rate; the parent particle grains, over 1 mm in size, are also broken up close to or within the COSIMA collection funnel and target plates, influencing the final morphology of the clusters. A number of major collection events were also identified, defined as a large number of particles collected in a short period of time. For example, during one day-long collection period on 24 January 2015, 76% of the total volume of grains identified arrived in that one day. Major collection events include all types of grain types, albeit with different distributions for each event. It is therefore assumed that the clusters share a similar path from the comet surface to Rosetta as compact particles, with a large contribution from mm-sized ‘fluffy’ particles lifted from dust mantle. Some of the more compact particles are thought to originate directly from active regions (as supported by GIADA measurements), while farther from the nucleus they are part of large clusters that fragment close to COSIMA. At close distances to the Sun (less than 2.35 AU), the compact components constitute more than 30% of the small fragments of parent particles (50 to 100 μm in size), indicating an evolution from mm-sized parent particles dominated by fluffy material to parent particles with more compact small sub-components. 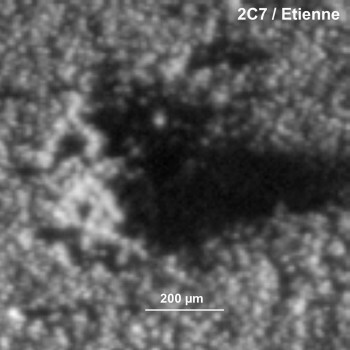 This evolution in terms of the components of large parent particles is thought to be linked to the removal of a dust layer dominated by fluffy material beyond 2.35 AU that uncovers cometary layers from which large parent particles with higher mean densities could be released as a result of the higher level of activity of the comet at close distances to the Sun. 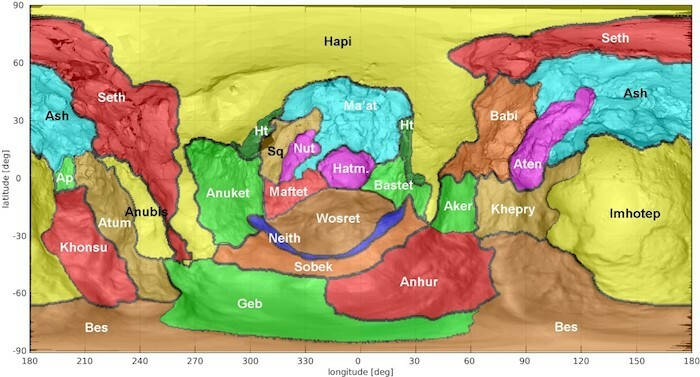 This also supports the conclusions published by the COSIMA team earlier in the mission. 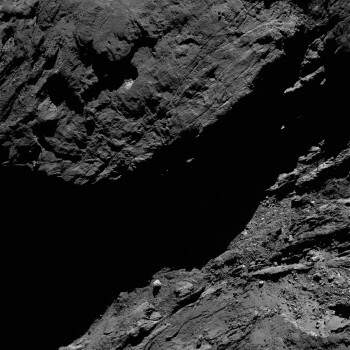 This week, CometWatch features an image of Comet 67P/Churyumov-Gerasimenko taken by Rosetta's NAVCAM on 1 March 2016, when the spacecraft was 26.7 km from the comet nucleus. Now that Rosetta has been able to safely approach Comet67P/Churyumov-Gerasimenko again following the active months around perihelion last August, scientists have been able to better image the southern hemisphere regions of the comet. This week the spacecraft is around 35 km distance from the nucleus, meaning that the OSIRIS narrow-angle camera can image the comet's surface with a resolution of around 80 cm/pixel. Asteroids probably ferried water to an infant Earth (SN: 5/16/15, p. 18), but they weren’t responsible for our planet’s entire chemical inventory. Comets might have trucked in noble gases and much of the raw material needed for life, researchers suggest online March 9 in Earth and Planetary Science Letters. Noble gases don’t play well with the other elements. They typically shun chemical reactions, which means their abundances haven’t changed much since the formation of the solar system. Comets are thought to be frozen relics from the birth of the planets, but until recently researchers didn’t know how much of any noble gas comets carried. 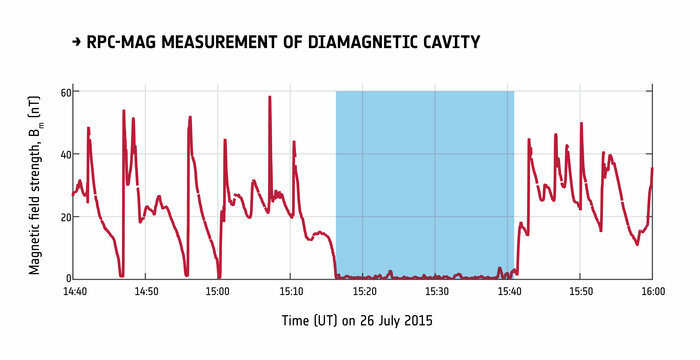 That changed shortly after the Rosetta spacecraft arrived at comet 67P/Churyumov-Gerasimenko in August 2014 (SN: 9/6/14, p. 8) and made the first measurement of argon in a cometary atmosphere. It’s not much — roughly 1/100,000 the amount of water — but it’s several orders of magnitude more than the abundance of argon in icy asteroids. And that’s enough for comets to have been a major source of argon (and presumably other noble gases) to Earth, Bernard Marty, a geochemist at Petrographic and Geochemical Research Centerin Vandœuvre-lès-Nancy, France, and colleagues report. The delivery arrived during the Late Heavy Bombardment about 600 million years after the start of the solar system, Marty and collaborators suggest. That’s when the moon (and supposedly Earth) was pummeled by debris from the outer solar system as the giant planets abruptly settled into their current orbits. Argon might seem of little relevance to everyday life. But “if argon came from comets, we can make some inferences about how much prebiotic material came in comets too,” Marty says. And those other goodies, such as amino acids, might matter a great deal. Assuming that all the argon in Earth’s atmosphere came from comets, and that cometary levels of amino acids (which no one has measured) are similar to what’s found in meteorites known as carbonaceous chondrites, the researchers calculated how much amino acids comets could have delivered to Earth. 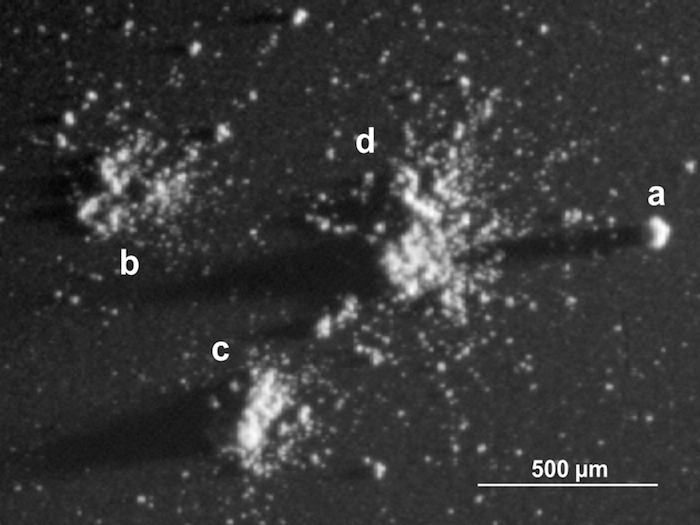 Dust collected from comet 81P/Wild 2 by the Stardust spacecraft in 2004 showed some chemical similarities between its quarry and those meteorites. It’s a rough calculation, Marty admits, and it assumes that the deliveries survived the impacts. 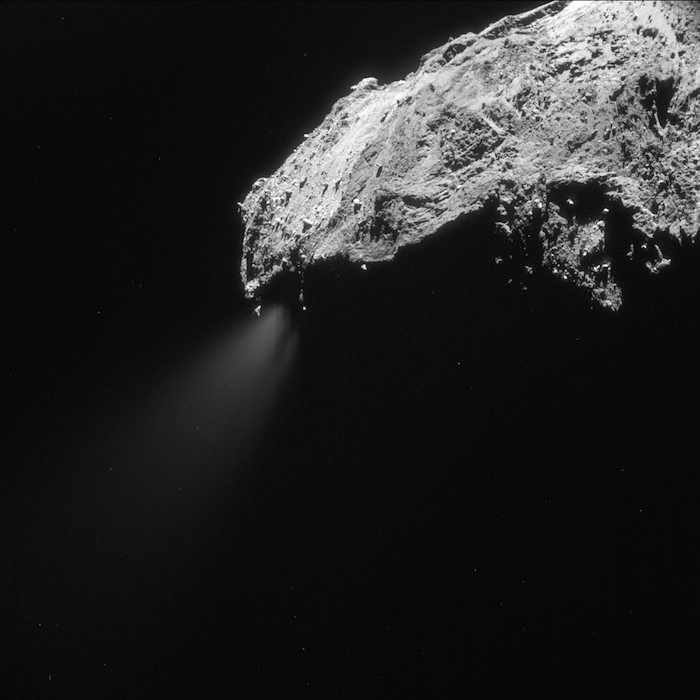 But the team estimates that the amount of amino acids supplied by comets could roughly equal the total mass found in all organisms from paramecia to plants and people. “I think it’s an interesting exercise,” says Conel Alexander, a planetary scientist at the Carnegie Institution for Science in Washington, D.C. “But it’s full of so many uncertainties. My worries are that we still know so little about comet composition.” The amount of cometary argon, for example, is based on just one comet. Other comets have shown tremendous variability, for example, in the relative amounts of water isotopes. Researchers also don’t have a good handle on the concentration of other noble gases, such as xenon, lurking in comets. There’s also uncertainty about the Late Heavy Bombardment that presumably brought the comets to Earth. Evidence for the influx of debris comes from a spike in craters on the moon roughly 4 billion years ago. But the timing comes from lunar rocks collected by Apollo astronauts and those samples might all have come from one basin, says Alexander. Rather than revealing the ages of many craters, the moon rocks might record the date of a single run-in with a giant intruder. Recent computer simulations also indicate that the giant planet tango that allegedly triggered the bombardment should have removed at least one of the inner planets, which doesn’t appear to have happened. To avoid that catastrophe, the gas giants had to have settled down before the rocky planets finished forming and so wouldn’t have been available to fling things at Earth 600 million years later. Comet 67P/Churyumov-Geraimenko’s dust trail has been observed to stretch at least 10 million kilometres in the latest images taken by professional astronomers working on the ground-based observing campaign. 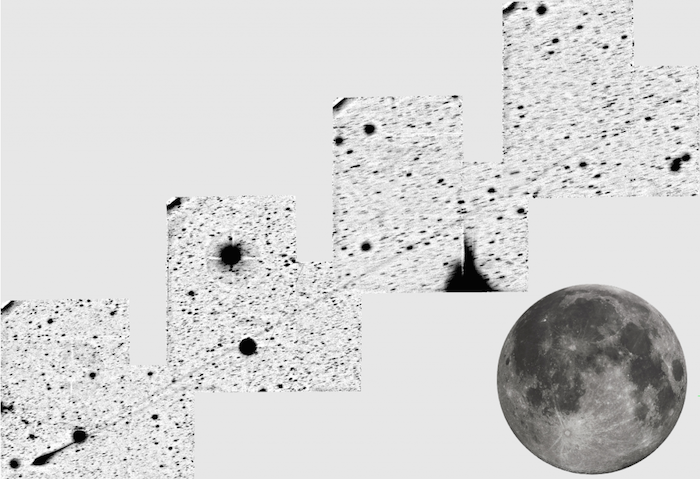 The image mosaic shown here is composed of four images taken using the 2.5 m Isaac Newton Telescope on La Palma on the night of 12 March. R-band mosaic of Comet 67P/C-G on 12 March 2016, taken with the 2.5m Isaac Newton Telescope on La Palma. The brightest part of the comet was imaged for 30 minutes, while the most distant parts of the dust trail required 1 hour of exposure. Credit: Isaac Newton Group/John Davies/Alan Fitzsimmons/Colin Snodgrass. 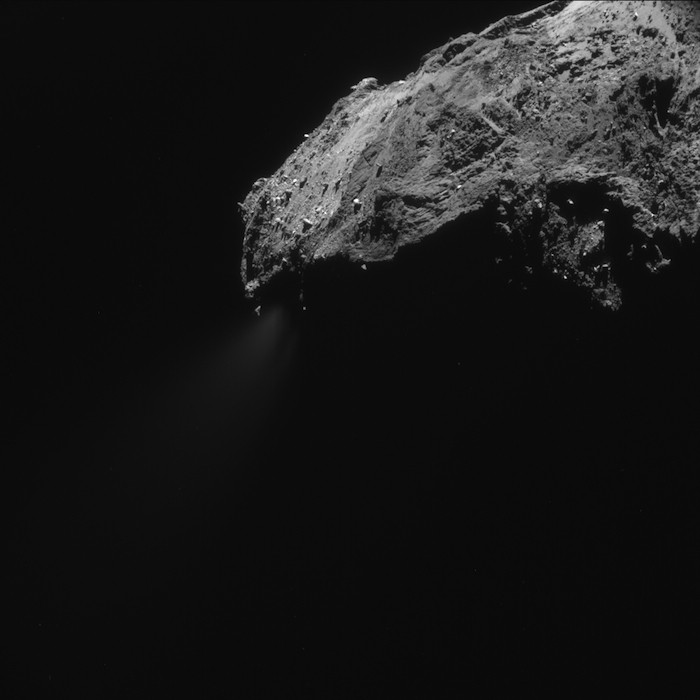 The image shows reflected light from dust grains and highlights the comet’s various tail structures. Similar images were obtained by amateur astronomers a few months ago when the comet was closer to the Sun and much brighter. Most striking is the long trail, stretching over two degrees from the comet – equivalent to the apparent size of four full Moons on the sky as seen from Earth (see graphic below for scale) – or greater than 10 million kilometres at the comet's distance. 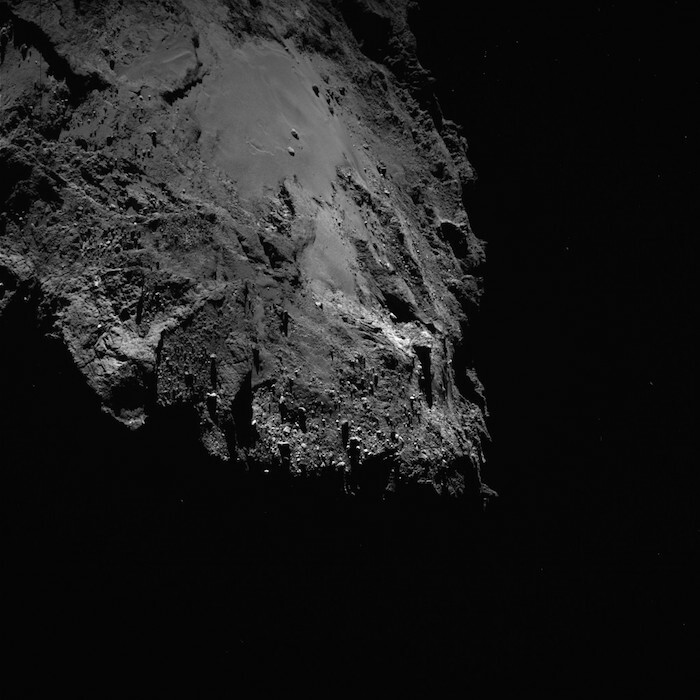 By comparison, Rosetta is flying beside the comet nucleus as close as just 10 km. The long trail is made up of larger grains left behind in the orbit of the comet, probably from several previous passages of the comet around the Sun. When the Earth passes through similar dust trails from other comets it gives rise to meteor showers. Unfortunately this won’t happen with 67P/C-G, as the orbit does not approach our planet. The shorter dust tail just below the trail is a 'neck-line' structure, made from dust grains ejected by the comet during this current orbit. Any anti-solar tail of the comet would be to the south but not so readily seen; in any case it would be very foreshortened in this geometry as the comet was at opposition, and at about 3 degrees phase angle, so the tail is mostly 'behind' the coma from our point of view. Comet 67P/C-G’s long dust trail, seen with a full moon for scale. Note that the Moon shows the apparent scale on the sky as seen from Earth rather than the physical scale – the Moon would be much smaller at the comet's distance. Credit: Isaac Newton Group/John Davies/Alan Fitzsimmons/Colin Snodgrass. This week’s CometWatch entry from Rosetta’s NAVCAM was taken on 19 March from a distance of just 12 km. 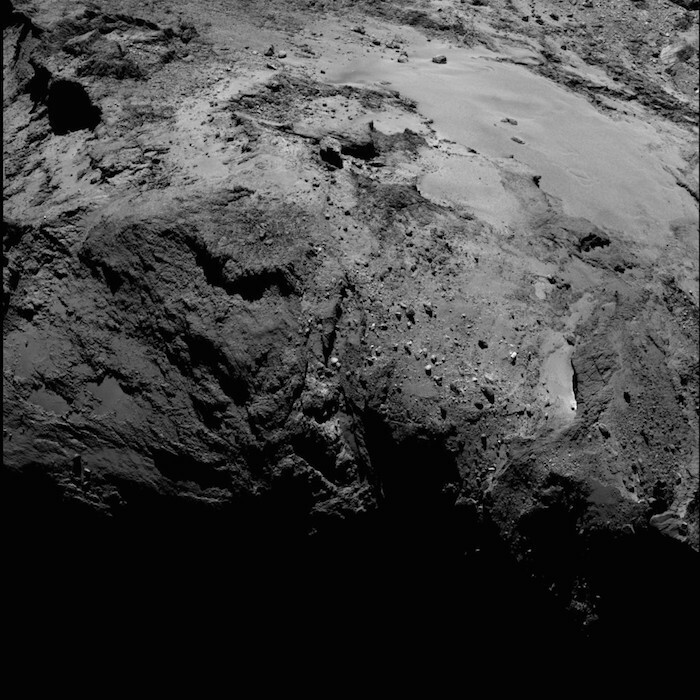 Lightly enhanced Rosetta NAVCAM image of Comet 67P/Churyumov-Gerasimenko taken from a distance of 12 km. The image scale is 1 m/pixel and the image measures 1.1 km across. 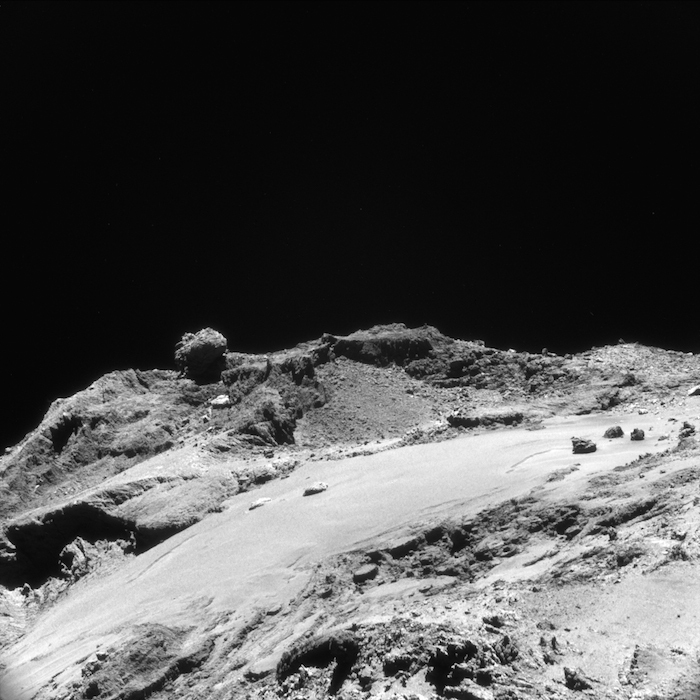 Credit: ESA/Rosetta/NAVCAM – CC BY-SA IGO 3.0. It captures a beautiful oblique view across the plains of Imhotep, taking in the cluster of boulders to the right of the image that includes 25m high Cheops. The rugged, fractured terrain and debris slopes in the background, where Imhotep meets Khepry, makes for a spectacular horizon. 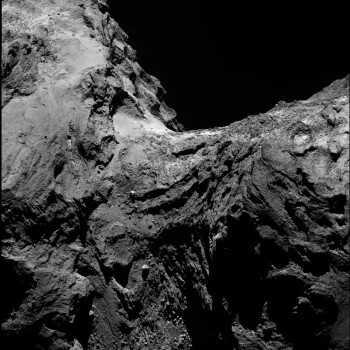 This region can also be seen, albeit from a much different orientation but which shows the wider context of the region, in the OSIRIS wide-angle camera image below captured on 16 March. 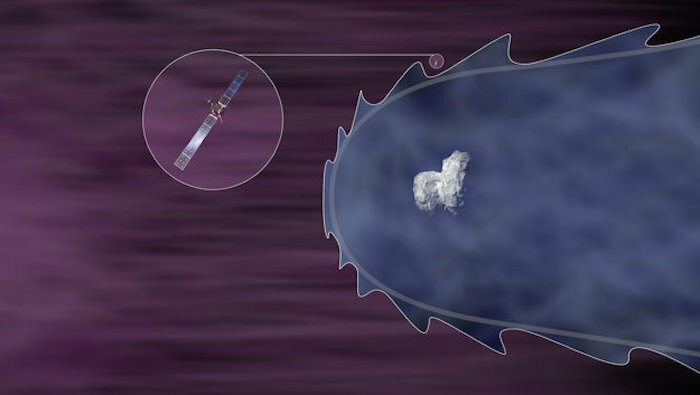 Following the brief encounter at these close distances, Rosetta is now heading out on an anti-sunward excursion to around 1000 km to investigate the comet’s wider coma, tail and plasma environment. 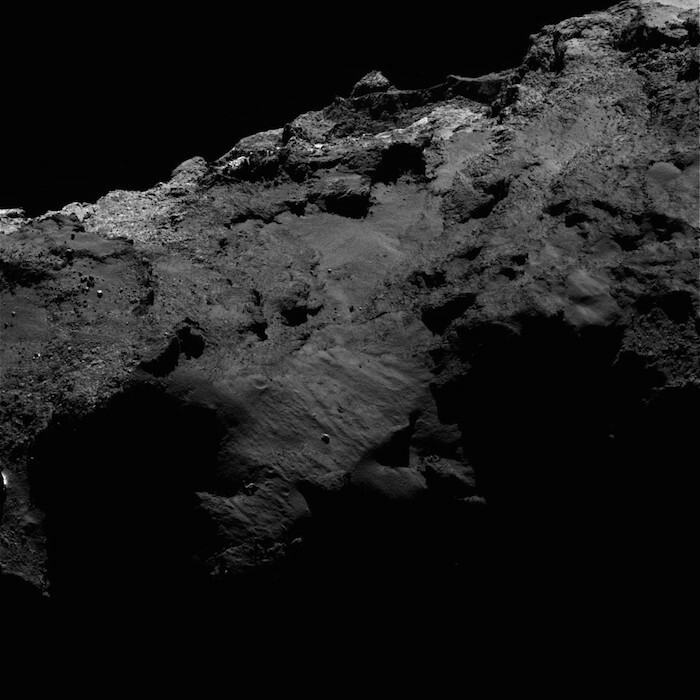 Today, 24 March, Rosetta is already over 200 km away from the comet. The current plan is for Rosetta to make a 30 km zero phase flyby around 9 April, before entering back into closer bound orbits by 21 April. Follow the spacecraft’s trajectory in the coming weeks with the Rosetta NOW tool.